SoftMaker has released the latest version of its free office suite, SoftMaker FreeOffice 2018. FreeOffice is one of our top recommendations if you're looking for a free alternative to Microsoft Office thanks to its support for native Office file formats, flexibility and ease of use. SoftMaker FreeOffice 2018 includes three apps: TextMaker for word processing, PlanMaker for spreadsheets, and Presentations for dynamic slideshows. While the previous version could open DOCX, XLSX and PPTX documents, SoftMaker FreeOffice 2018 can also save in these formats. It also supports the older DOC, XLS and PPT file types, plus loss-free ODF files used by LibreOffice and OpenOffice. 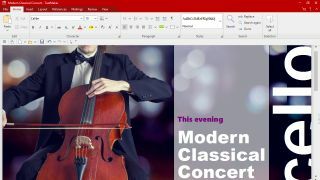 The updated FreeOffice suite offers a choice between a classic menu system and Microsoft Office style ribbon. That means there's practically no learning curve if you're making the switch from Word, Excel and PowerPoint, and you can share documents with Office users seamlessly. SoftMaker has improved FreeOffice's menus too, with extra formatting options available with a couple of clicks (including complex list options in TextMaker and cell templates in PlanMaker). SoftMaker FreeOffice 2018 is available to download now for Windows and Linux, and is free for both business and personal use.